It’s 7:00 on a frigid Saturday morning in late December and Dino Funari’s cramped basement in Hull is stirring with activity. While most people are tucked under their covers, sound asleep, he and his crew are just starting a typical 10-hour, double-batch brew day. Dino measures and mills grains while another member of the team heats water and prepares to mash in. A third readies a few additional ingredients and a fourth re-checks the recipe details to make sure everything is accounted for. Vitamin Sea’s Instagram profile is loaded with mouthwatering snapshots of their beer. In two weeks, the finished beer, likely a soft, hazy IPA or maybe their signature stout, will be tasted, canned, labeled, and stored in the refrigerator case. Then, Dino or someone else will pour some into their designer glassware and take a captivating picture of it to post on social media. If you’re a serious craft beer connoisseur you’ve probably drooled while admiring one of those pics in your Instagram feed. Here’s the kicker: despite all that effort, and all the banter among beer geeks, no one will buy any of it – not a drop. At least not yet. 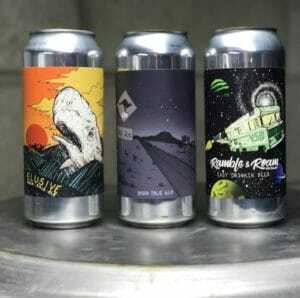 That’s because Vitamin Sea Brewing, a one-barrel nano operation producing small-batch beers packaged in stylish 16-ounce cans with stunning artwork, isn’t yet a commercial brewery. By Federal law, they’re limited to brewing just 200 gallons of beer per year and they aren’t allowed to sell it. Such legal limits have often prevented them from getting as much beer as they’d like into the eager hands of their many followers, some 5,500 on social media alone. But all that is likely to change in the coming months. 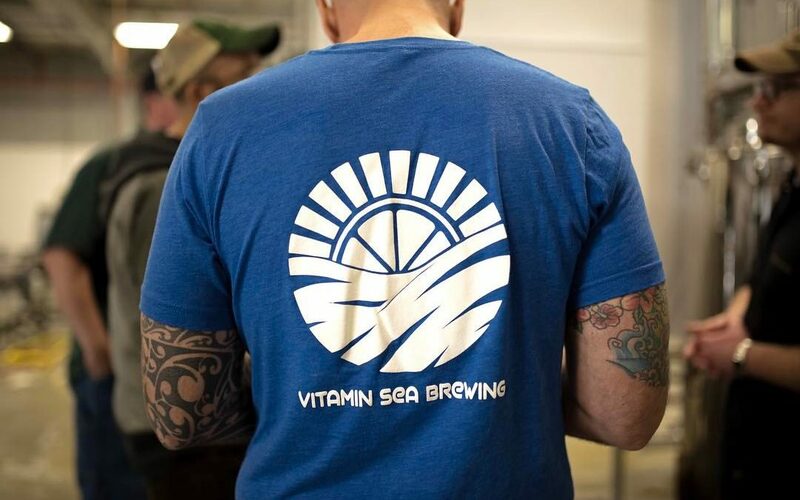 Once they secure the necessary permits and approvals, install a new 10-barrel system, scale up their recipes, and build out a taproom, it shouldn’t be much of a leap to commercial brewing for Vitamin Sea. That may sound naive, but Funari and his three partners aren’t your typical home brew outfit. 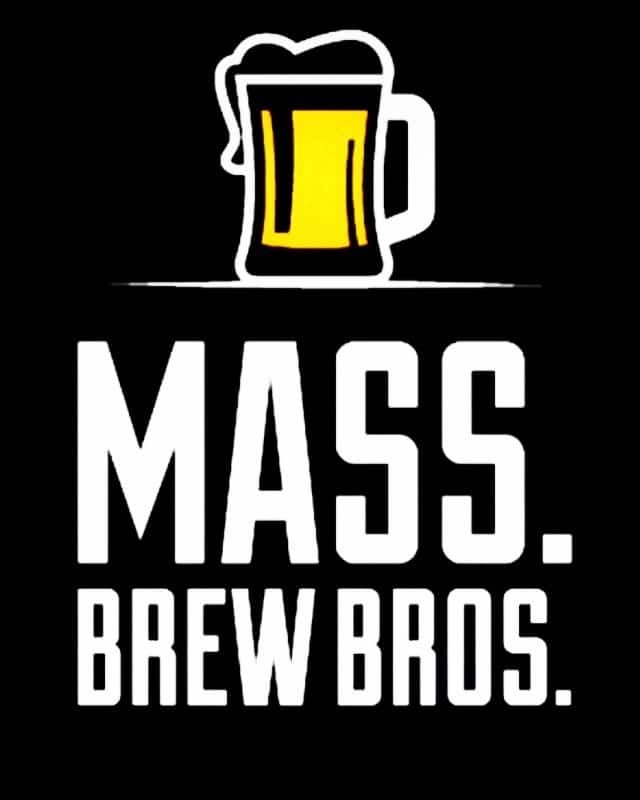 They employ an eager team of 3 or more volunteers on most brew days, have industry friends in high places that they regularly tap for guidance, and enjoy a cult-like following on both the South Shore and in beer crazy Portland, Maine. 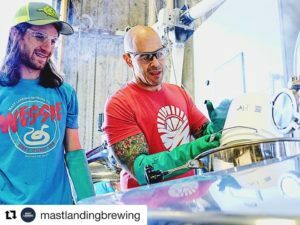 Dino Funari (right) and Vitamin Sea Brewing recently collaborated with Mast Landing on a highly rated IPA called Same Sun. 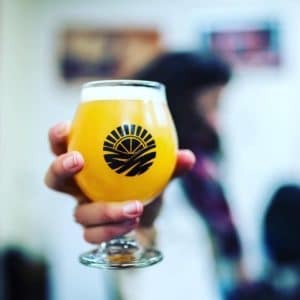 Already they’ve been involved in two commercial brewery collaborations, one a barrel-aged imperial cream ale named House Call that they did with Weymouth’s Barrel House Z, and another called Same Sun, a double dry hopped IPA brewed at Portland’s Mast Landing. Both beers faired quite well on Untappd. Prior to the collabs, they excelled on the amateur circuit as well, winning a couple of local home brew competitions and attracting numerous invites to pour at charity events and private parties. Recently they’ve turned down other opportunities in order to focus on their business plan and prepare for the transition. 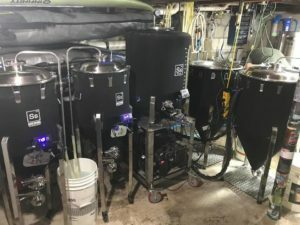 The one-barrel nano brewery in his Hull basement “has everything the big guys have, just on a smaller scale,” says Funari. The others Funari refers to include co-founder Peter Kiley, aka “The Professor,” and the one with the longest tenure as a home brewer. A chemistry minor in college, he’s largely responsible for recipe development. One of those manning the kettle for those recipes is Josh Sherman, Funari’s brother-in-law, referred to as “Josh Knife” for his ability to jury rig any number of items in their makeshift basement brewery. “It’s his fault,” he responds, pointing at Funari, while relaying how he got involved in the project. “He gave me a home brew kit at a holiday swap years back.” The fourth partner is Rich DiBona, Funari’s longtime friend and now business manager. Since officially coming on board a few months ago he’s taken over the search for a commercial space, initiated the licensing process, and projected out the financing. The remaining cast of characters, referred to as cellar men and tagged with colorful nicknames like “Red Hat Rob” or “001,” are nearly as invested as the partners. Safe to assume they aspire to one day being employed at the future brewery, assuming things go according to plan in 2018. Much of that will depend on careful execution of the business plan, a large part of which falls on the shoulders of Funari. “I’m just the sticker guy,” he jokes, poking fun at himself and his penchant for peddling endless merchandise and schwag. Vitamin Sea’s can labels feature artwork by Dean McKeever, who also works with Tree House and other notable breweries. For now, it’s time to start canning the batch of Double Winter IPA that’s been waiting in the bright tank for the last week. After that, get the second batch of today’s brew in the fermentor. Then it’s cleaning, cleaning, and more cleaning. In a few days it will be time to transfer, do a gravity check, and start dry hopping. And then more cleaning. Dreaming is easy, brewing beer that compares with the high quality liquid being produced by many commercial breweries these days is actual work.